^ Lonergan, Aidan. Gerry Adams confirms Sinn Féin will not swear allegiance to the Queen to take Westminster seats. The Irish Post. 2017-06-09 [2019-02-22]. ^ Pay and expenses for MPs - UK Parliament. Parliament.uk. [2014-04-08]. ^ Second reading （英语）. The Government minister, spokesperson or MP responsible for the Bill opens the second reading debate. The official Opposition spokesperson responds with their views on the Bill. The debate continues with other Opposition parties and backbench MPs giving their opinions. 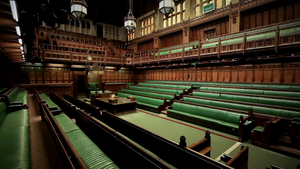 At the end of the debate, the Commons decides whether the Bill should be given its second reading by voting, meaning it can proceed to the next stage. It is possible for a Bill to have a second reading with no debate - as long as MPs agree to its progress. ^ Eric Taylor. The House of Commons at Work. Harmondsworth: Penguin. 1971. ISBN 0140202579 （英语）. ^ Current State of the Parties. UK Parliament. [2019-02-22] （英语）. Kenneth Mackenzie|Mackenzie, K.R., "The English Parliament", (1950) Pelican Books.